Just when I begin to think that I havebn’t seen anything from Laic217 for ages, up pops a new piece in one of his favourite spots. All the usual motifs we are accustomed to seeing in this artist’s work are here: the bucket hat and smiley; the gold chain with 217 and skeleton dressed in a tracksuit top. All very Laic. This piece is interesting in its use of bright colours on the black background, it gives the whole thing a strong and fresh look. The smile on the hat has an interesting shadow, which would suggest a light source quite close and to the right of the piece because of the way it lands on the hat. (I think I know what I am trying to say here). Finally, you just have to admite the gold rings on each hand spelling out LA – IC, awesome stuff from a firm favourite. Laic217 is most definitely back on the street again after something of a quiet time recently. This writing and character piece, typical of the artist, contains a skeleton in a beautiful quilted jacket, which has been sprayed expertly, to give shadows and texture. The greeny blues contrast nicely with the pink background and the whole piece has something of a familiar feel to it. Of course, no Laic217 piece would be complete without a smiley or a bucket hat, and this one has both. I don’t know why he has been fairly quiet recently, maybe he has work commitments, but it is great to see him back out again, and there are a couple more works from him to follow soon. This is a lesson in always making sure you get a photograph of a new piece when you can, even if the photograph is compromised by poor light conditions or weather of street furniture etc. If you don’t snap it up straight away, then the next time you see it it may be tagged. This piece by Laic217 appeared in The Bearpit in October after something of a quiet period in his street work. I managed to photograph it, but the morning sun was casting a shadow across the wall. I figured I would return to get a ‘clean’ picture. The next time I visited however the smiley face had been tagged, albeit rather tastefully, with a tribute. Annoying as it might seem, this is all part of the street/graffiti art scene. As always I like this work from Laic217, and hope he keeps it up. I have been enjoying the incredible progress he has made in the time that I have been doing this and get pleasure from seeing the direction his work goes in. I took this picture a couple of months ago in Bedminster, and of course it is instantly recognisable as a piece by Laic217. All the signature elements are there, a portrait, distortion, this time through broken glass, the bucket hat and smiley. it was after seeing this piece, that the frequency of work Laic217 was churning out decreased markedly. I am pleased to say that he appears to be back up and running and firing on all cylinders. 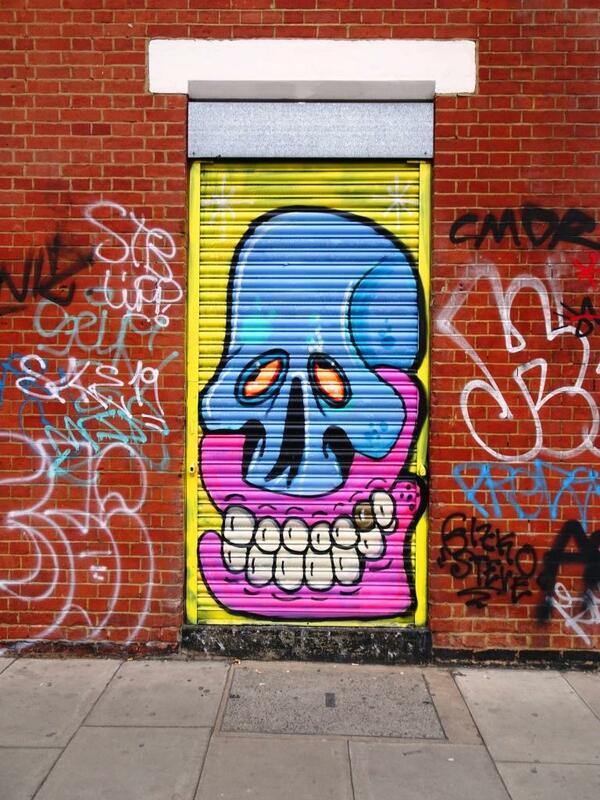 Although this is not my favourite of his pieces, it is striking, and the colours really stand out. Anyone who was at Upfest 2016 would have been utterly charmed by the incredible tree frogs by JXC. It was one of my favourite pieces from last year, and I wrote about it here. This year he was afforded a larger wall, one that Voyder wrote ‘Bristol’ on last time round. Instead of tree frogs, JXC treated us to an extraordinary seascape with a rather intimidating octopus in the foreground and some naval mines in the background. This was another of the pieces that probably took longer to create than might have been expected, due to the constant rain interruptions over the three days of the festival. The mouth on the side of the octopus isn’t the octopuss’s beak, rather is it a shark mouth inked onto its side. JXC’s work is heavily inkled with words and drawings that resemble tattoos, creating an interesting effect o the surface texture of the subject. There is a story going on in this piece which is a little tricky to decypher. The words ‘Just Lie’ appear under the shark but I’m not sure what that refers to. Nice to see a smiley on the bomb – some ironic commentary there?